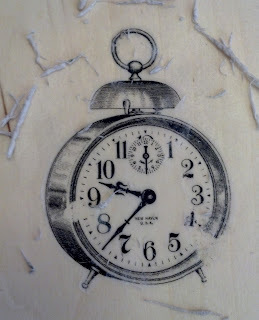 Ok, I've had several requests, both on the blog and in person, for instructions on how to transfer an image to wood. I had a few scrap pieces laying around so I thought I'd write up a quick tutorial for everyone. *UPDATE* Check out my tutorial for transferring COLOR IMAGES!!! Find the image you would like to transfer. Adjust it to the correct size and reverse the image, especially if there is any wording involved. 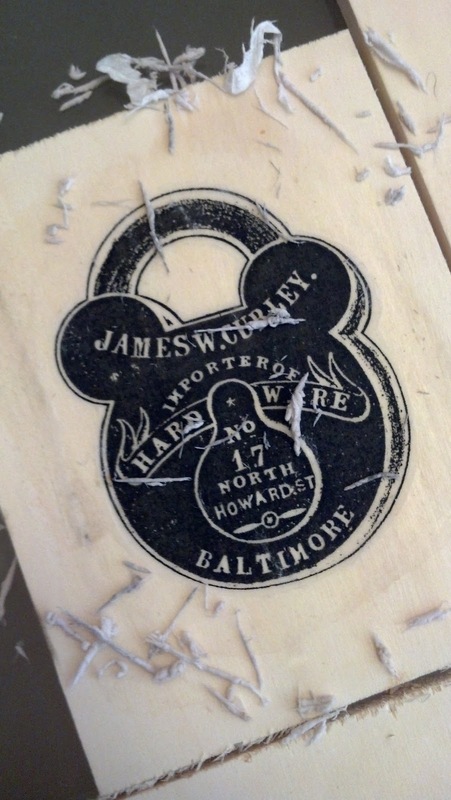 Grab the wood you want to transfer your image on. Be sure it's painted or stained the color you want beforehand. 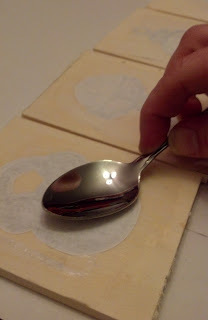 Brush on Mod Podge where your image will be placed. Flip your image over, image face down, and rub onto the board. I typically just use my fingers but I have used my brayer before for larger pieces. Some suggest using the back of a spoon which I tried for this tutorial and discovered I don't like it. I gouged my clock. 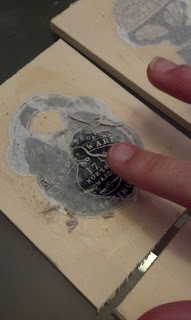 That doesn't happen with your fingers or the brayer. Now the hardest part.... walk away for 24 hours. For my Vintage Wine Crate Coffee Table I left the images to dry for 24 hours however... there are exceptions to this rule. If you want your image to be a little rough... aged, we'll call it, then only leave the image on for 5-10 minutes. This is the technique I used with my Spoon and Fork Vintage Artwork. Whichever technique you decide to use, when you're ready, soak the paper with a wet paintbrush. I find it works best to wet the paper until you can make out the image coming through. Rub the paper off at this point. I recommend letting the wood sit for another 24 hours to make sure you've removed all the paper. If there is any paper left it will be noticeable even if you plan to put some kind of finish on it. So make sure all the papers removed. when the paper dries, so make sure you get it all. I hope this helps everyone and answers any question you might have.... if not, let me know! *UPDATES* Check out my tutorial for transferring COLOR IMAGES!!! And also take a look at this helpful tip if you're doing an image transfer on Stained Wood. *IMAGE LINKS* Here's a list of images I've used from The Graphics Fairy. This is awesome... definitely pinning for later! Can't wait to try it. Just to clarify - it will also work on wood that's already painted or stained? And, have you ever tried it with an actual photograph instead of a graphic? Thanks! I've never tried this technique with a photograph... that would be interesting to try though. I'd also like to test out some color prints to see how they turn out. On your second method, that's all you did was use water & a brush?..The hard part for me will be picking out an image I want to use! Thanks for your blog, I just subscribed to it! Can you use a scraper instead of your fingers to get the paper off? Will this ruin the image? I haven't tried it but I think your image would be ruined. How do you prevent the image coming off, too? This just happened with my project. A couple of possibilities, most likely you either didn't use a Laser printer, the mod podge wasn't completely dry or I've also found if you don't put enough mod podge on the image it won't transfer. Hope that helps! Would it be ok if I used glossy mod podge? I'm using the technique on stained wood. Or should I buy the 'matte' version? You will notice where your glossy mod podge ends and your surface begins... unless of course the surface you're using is also glossy. I've stayed with the matte because of the surfaces I'm using. First of all: wow!! Lovely how you are so creative! I wonder... would it work with photo's as well? I followed your instructions but dont know why after wetting the paper, i couldn't rub off the very first layer that also has the print on it. it sticks onto the wood like super glue, and wont come off. if i try to take it off, the print will also come off. help! I followed your instructions too. I waited 12 hrs and some of the part came off well. 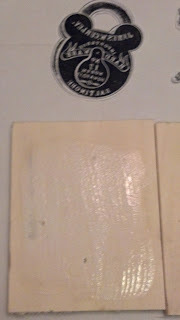 I thought that it was too early so I waited another 12 hrs to peel off the other half, but it got too hard to peel off that paper and modpodge is stuck to my wood and I can't get it off except with a knife. I tried the 2nd time and waited 10-20 minutes. The modpodge apparently hasn't fully dried yet thus when I wet the paper, everything came off, including the image. Help? hello all. you can lightly soak a sponge in acetone, place the paper toner side down, and rub the sponge on the back of the paper. The less acetone the better. The toner will transfer the same way instantly, with no other steps needed. This may sound weird but is there a time span u have after printing tht u have to put it on the wood?? I have to imagine the "fresher" the better. I've never tried an image transfer on old paper though. So u think if I were to print the paper the day b4 it will work?? Btw: I dnt have a printer at home!! Thts why id have to go to a package store!! I think printing it the day before would be fine. Good luck! How long do I rub the picture into the wood for? You're actually rubbing the extra paper off of the wood. So only rub until there's no longer any white paper showing. Sometimes you have to let the wood and paper dry overnight and come back the next day. You'll notice white spots where there's paper still remaining. Wet it down again and continue to rub. 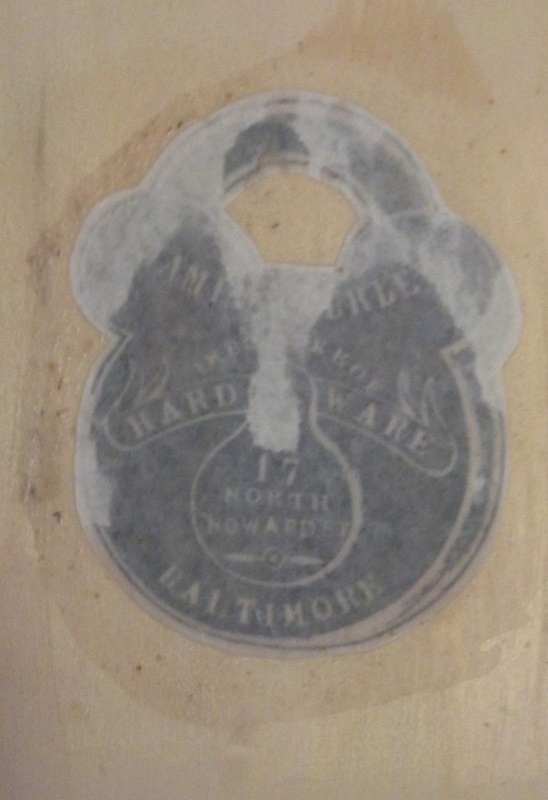 I tried staining the wood before transfering and it did not work, it peeled off. Unlike the others I have done, it was not stuck to the wood. what kind of stain have you used that worked. I painted my furniture w/ chalk paint and used this method. The image transferred, but in rubbing off the paper, the paint began to smear and rub off. I saw a technique using transparency film (for over head projectors) which can be printed with an inkjet. I plan to try this next since there will be no paper to rub off. Hi! It looks great! But, do you know if it works with a colored print? 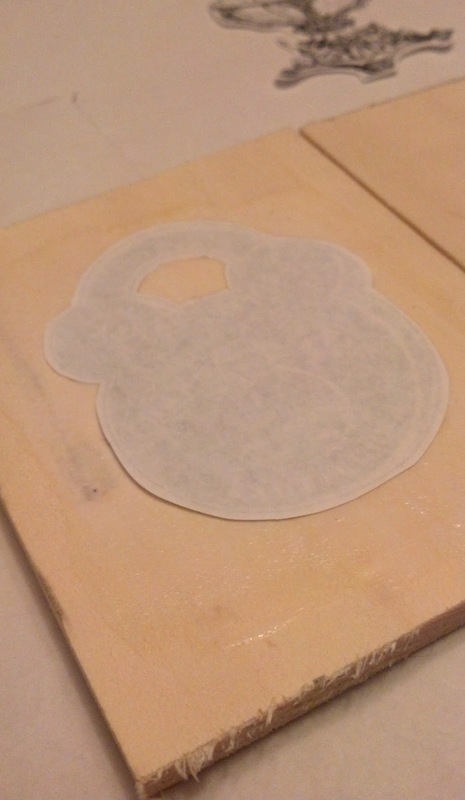 This is definitely the best tutorial for transferring images onto wood. I loved it - it is very simple and definitely doable. Thanks so much. Using a Gel Medium which you can find at a local craft store in the paint area works the best. And yes you can use color prints. Help! I just transferred my first image and there is a lot of glue left on top of the image. It wont come off with the paper. I may have been too generous with the mod podge. Should I sand it off and start over? I dont know how else to get the dried mod podge off without wrecking my image. This is my first time with mod podge! Molly, I would try to lightly sand your image/wood and see if that helps remove some of the glue without destroying your image. I'll scour the internet to see if there are any other options before completely sanding down the entire thing. Your image doesn't necessarily need to be reversed but sometimes they do look a little off if you don't reverse it. Totally up to you. Don't rule out plywood altogether. There some out there with a smooth finish. I'm most familiar with birch plywood, I've used it for various other projects. But you should be able to find oak which I believe is fairly smooth. What size do you need? Hi! I just tried this on some crates I got from Michael's and the image rubbed off completely when I rubbed the wet paper off. The only thing I can think of I did differently that in your tutorial is I stained the crates before applying the modpodge and image. Any ideas where I went wrong? I have 4 crates and only rubbed off one so far, but stopped after that happened. I waited 24 hours... is it possible I am rubbing too hard? I didn't seal the stained wood with anything. Just straight stain, which I let dry for about 4 days. Any ideas or suggestions would be so great! I'm determined to make this work!! Thanks!! The paper shouldn't completely peel up. Wet it just enough that you're rubbing the paper off a layer at a time. I hope that helps but email me if you're still having issues. I've made more tables since this blog and transferred onto stained crates with no issues. That will probably do it! If you wet the paper too much it seems to wet the glue enough for it to peel up as well. It's a slow process but well worth it. So I guess the water isn't entirely the problem. With the next two I was rubbing it while it was practically dry (ouch!) and to get all the white of the paper off, I end up with black finger tips and the image wiped away. I'm going to try applying again with less modpodge. Determined, I am!!! I'll keep you posted! Did you print it on a laser printer (not ink jet)? Have you ever tried this on MDF (which is like a pressed wood)? I haven't actually used MDF for just a transfer. I did use it on my Spoon and Fork Artwork. http://diy-vintage-chic.blogspot.com/2012/06/spoon-and-fork-vintage-artwork.html I don't think there would be any issue except be careful when wetting your paper to peel off the image. MDF warps fairly easily so if your drenching the paper (and board) with water it might get a little warped. Thanks so much for posting this! I think I'm going to try your method on something I've been thinking about doing. 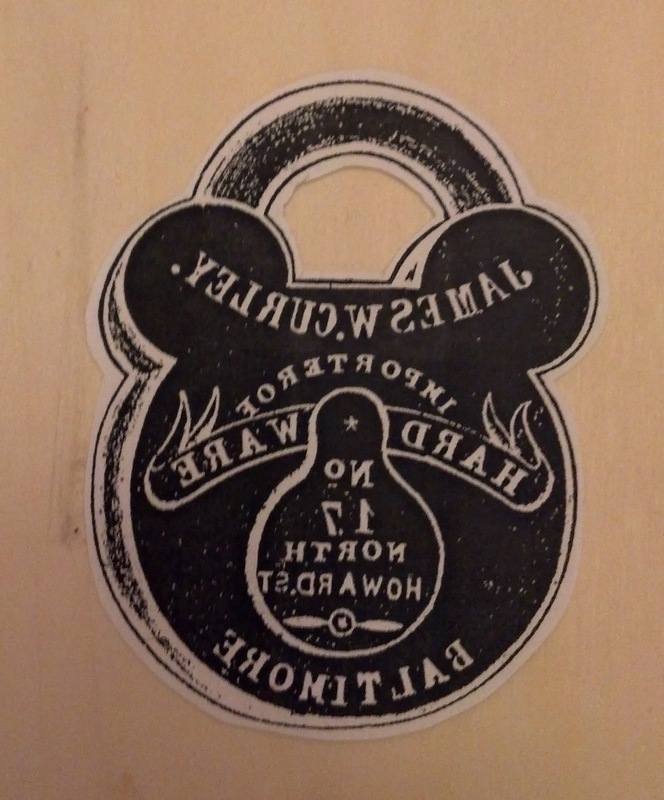 I've got this linked to my DIY image transferring post too today, for tips and tutorials! I have 2 in my office and they look amazing. I am actually trying to do something like this only with quotes on bathroom tiles for coasters. I've accidentally been using my ink jet printer which will fix one problem, but the other I'm having is even after using matte mod podge I can still see the edge of where I've but around the quote and the rest of the tile. Is there any way to fix this? For one, be careful how much mod podge you apply when transferring the image. I've noticed that line when I've globbed on the mod podge. Also make sure you're rubbing away all of the paper. hi when ive finished the project can i put a wax finish over the top of the design like annie sloan wax. I haven't tried it myself but I see no reason why a wax finish would be an issue. I did it! Looks amazing! Though, rubbing the paper was such a pain especially with those tiny paper fibres. Anyway, I need to get more wood now. haha..
Hi Becca, my prototype worked amazing as mentioned earlier. 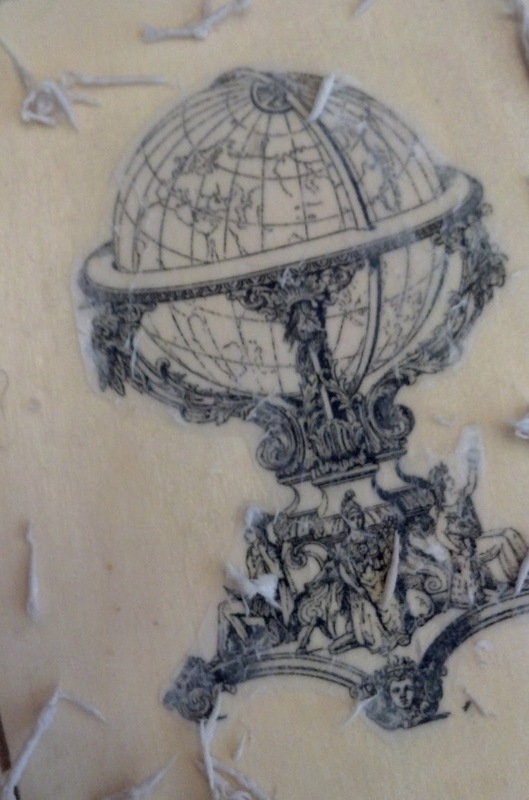 Though, when I tried it for real on another different piece of wood, it was disastrous when I begin rubbing the paper out! Is because I used a different sort of wood? Or applied too little mod podge or too moist it with too much water? Could be any number of reasons but I've never had an issue with the type of wood I'm using unless it's extremely rough. Always use as little water as possible and take your time. Walk away for a bit if you need to and give those fingers a rest. Have you tried it with color photos? I want to get a large color photo done and am not sure if I want to do it myself or leave it to one of the online print on wood companies like www.plakthat.com. I was thinking something about 20" x 30" . . . Any help would be appreciated! I have not tried it but that sounds like a fun tutorial. Maybe I'll sneak that in this week.... stay tuned! Hi. I was wondering if you can tell me if there is a place online to purchase them printed? If not, where do you find your prints? This tutorial looks fantastic and I am very excited about trying it out. However, I only have an inkjet printer. Is it possible with this kind of printer? :( You can try it but in my experience it caused the ink to run. You can always take your pic up to a Kinko's and have them print a copy for cheap! I have made multiple of these over the last week, all on unstained wood, worked perfect. I tried last night to do it on stained wood, I stained it yesterday adn p ut the image on last night and tried to take the image off today and it didnt even stick to the wood. it just peeled off. any suggestions? Is your stain glossy? I haven't tried a glossy stain or paint but I imagine the image might not have anything to "grab" on to. Regardless, you may want to very lightly sand the area you're placing the image. Also, you may want to wait a day for the stain to completely dry and then place the image on. I used minwax wood finish. It doesn't seem to be glossy. I was able to peel off the entire image. I have not had issues with any other (without stain) What kind of stain have you had success with? I did peel off the glue earlier and sanded it to see if it would grip this time around. I am hoping that maybe the stain didn't dry or something. I'm new to staining so if you have found a brand that works well, let me know. Also is your stain water-based? I also usually work with minwax. My next guess would be the amount of time to let the stain dry. I usually wait a day or two between the stain and the image transfer. Hopefully that will help you. There are things that seem to be very difficult but a few tips and tricks can really make a difference. Thanks for sharing these techniques. You gave me great ideas for my next DIY project. 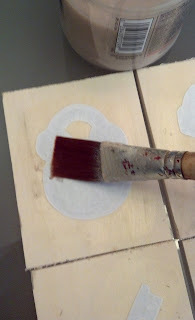 if you use gel medium instead of modge podge for the transfer it works a lot easier, same process just substitute the gel medium for modge podge After you have removed the paper and are confident that it is completely removed. 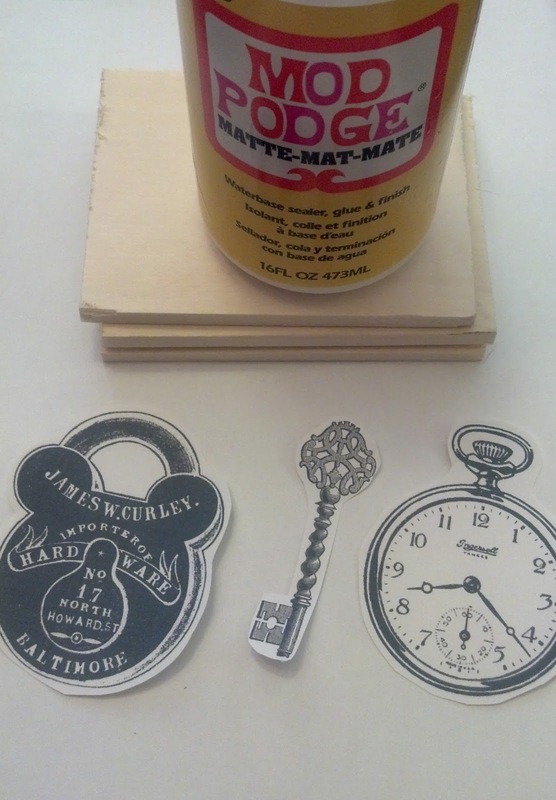 I would wait an hour, then you can cover your image (now on the wood) with modge podge and this will seal the picture. You can use black and white or colour photos and it works on almost any surface. the photo or picture must be printed by a laserjet printer, inkjet does not work as the ink is water soluble. So you have to use a laser printer? I only have an inkjet printer. Do you have to put some sort of sealant ot top coat (polyurethene or something) on this to keep it from coming off? I am planning to do this to a coffee table. 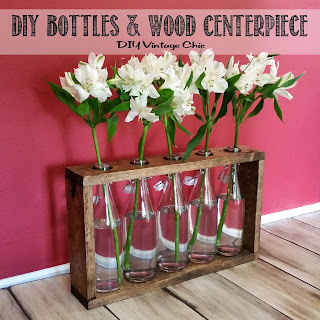 Stunning idea by which i am going to decorate my room thanks for sharing such a nice idea i was looking for the Toner Cartridge for Printers blog i just found this and right now i have bookmarked thanks again. will this work on an acoustic guitar with a finish? Hello, before I try this technique, just need to know.... How do I treat the wood before I place an image?. I have a tray painted with white acrylic paint and I am worried that when I try to remove the image with water all the paint on the tray will smudge....Should I varnish the tray before?, will the image still transfer? thanks in advance! Hey Chrissy - I would try dabbing some water on a part of the tray you won't notice and see if the water affects it in any way. I wouldn't think with the small amount of water needed that it would change the paint but its best to double check. I usually like to transfer my image before I put a varnish on so I've never tried it on top of it. I would assume it would work but I can't make any promises. I hope that helps. Good luck! WONDERFUL! many thanks to the particulars.you have shared nice method. your second method looking good, i think its' looking more pretty if you paint them. Thanks for posting this! I'm in the process of doing this on piece of stained wood right now. I'm using a mostly black and white photo that has small accents in red. I've got most of the paper off right now, and it's looking good so far. I'm letting it dry a bit before getting the rest. My question though, is have you had any issue with a tad bit of white showing up on black areas? The wood feels completely smooth, but as it dries, I still see small splotches of white on some of the black areas. I'm worried about rubbing completely through the black if I keep rubbing. Thanks again! I tried this but I'm a little disappointed... I did my image (words) on white paper.. After 24 hrs I'm rubbing off and there's white leftover (seems to be modge Pudge) so now my wood has white stuff then the wording on top. For whatever reason I thought only the black letters would transfer. I have pics to show you if the above does not make sense... Still looks "OK" I just wish there was no white. Did I do something wrong? Hi - doesn't sound like you did anything out of the ordinary. Unfortunately this seems to happen sometimes. I haven't been able to determine if it's do to temperature/humidity, too much modge podge, etc. I would suggest taking fine sandpaper and trying to rub the white off. Careful around words unless you don't mind have a vintage look. This is another option that I love for colored photos. You could mount the photo to the wood. Can this be done on finished wood? This is one of my first DIY projects and it was a hit and miss! Up to this day, I haven't identified why sometimes it works and sometimes not! Thanks - this tutorial was extremely helpful. Get Original ink cartridge from ShopGooro at the best price. It’s so nice of you, Becca to create and share thoughts like those in this article! I almost feel like spreading your thoughts on Transfer Image to Wood Tutorial among our fellows whose habits include visiting our website Spottingpro once in a while. Thanks to you! I discovered this post only yesterday. I see you’ve thought about this nice topic earlier than us. But I don’t expect you to end your discussion on the specific matter so soon. Can’t you please share more of your insights into it. Really, our neighbor groups who visit our website Sandersreview. oftentimes would be happy. Thanks a lot, Wisno!